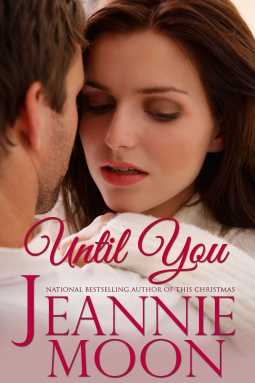 Until You – A Power-Packed Romance!!! “Until You” by Jeannie Moon is one of the most impressive books I’ve read in recent history. Loaded in emotions and insecurities, this is the story of 40-year old divorced woman, betrayed and hurt, having gone through a messy divorce, and spending a lonely birthday. Kate Adams thought she had a great life, until her husband cheats and leaves her for another woman. Katherine Adams as the famous author is confident and successful. But Kate Adams, the mother, the woman and a divorcee is hurting in the aftermath of a messy divorce and sustaining a fragile relationship with her teenage daughter, Laura. A chance meeting with the elite hockey player David Burke ends in a bedroom for both them as instant attraction flares between them. A bet with his teammates pulls David into a relationship that he cannot seem to forget or forgo. Age becomes a thorn in his side, before he realizes that he’s fallen in love with Kate. And David has an uphill battle to convince Kate that he truly loves her and is in it for the long haul. Jeannie Moon does a stupendous job with David and Kate. I don’t think words would do justice to these two amazing characters with layers of emotions and insecurities. The relationship between Kate and Laura is so vividly portrayed, wrought with pain, hurt and lies, and the relationship between Laura and David deserves accolades. The entire narration is perfectly played out with articulate dialogues, intense emotions of pain and passion as two individuals poles apart try to make a future with each other. The secondary characters, and the page space given to Kate’s ex-husband and his wife, and their role weaved into Kate and David’s life, makes “Until You” an exceptional read. Another definite winner from Jeannie Moon’s kitty! « Shaken Not Stirred – Arousing And Enigmatic!